Finding out what we are curious about. UPDATE: The YouTube Video as well as the slides from the RSCON4 session are at the bottom of this post. A couple years ago, I offered to cover 8 classes (spread out over a few weeks) prep-free so a teacher could tinker with an idea. I called it the “Fed-Ex Prep: Time for Innovation” (based on the idea shared by Daniel Pink in Drive – you can read my reflection here) as I was providing time for teachers to explore… with the idea they would have to deliver something back to the staff. Although this was successful, it only provided time for one teacher at a time and relied solely on me to cover. It was a good idea but not something that changed the structure or culture at our school. How can we create time for teachers and staff to collaborate without any additional cost? What will we focus on during this time? I spoke with many people and toyed with many ideas around shifting the school schedule (that is tied to the bus schedule that impacts most of our students) but this was going to take at least a year to gather input and support from parents, community members, and educators… and after those discussions, we still may have had hurdles to clear. At the same time I was exploring ways to create time, I was also reading/researching the idea of a Professional Learning Community (the DuFour model). Many people were helpful in this research (big shout out to my friends Bill Ferriter and Cale Birk) and I began to try to engage our staff in moving toward a PLC model and creating time in the schedule. I had an idea for time in the schedule and staff were on board for this time to collaborate; however as we started to move into the PLC model, I felt it was not fitting the culture of our school – I felt I was following a slightly top-down recipe rather than meeting our staff where they are and growing from there. (This is not a criticism of the PLC model… more of a criticism of how I was trying to implement it. I learned a ton from the reading and conversations that shifted my thinking.) After a few meetings with staff around this, it didn’t feel right so I threw a tweet out there that asked for Canadian educators’ experience (as our system is quite different than the US) with implementing a PLC model in an elementary school. One response caused a significant shift in my thinking – Delta principal Dr. Janet Lauman said she had done her dissertation (a must read) on learning communities in BC schools and she had seen successes and failures. She encouraged a “Living Systems” model she was using in her school that created time for staff to collaborate but was way more grass roots and free for innovation. After a few phone calls, coffee at Tim Horton’s, and dinner with a few of our teachers, Janet and I came up with a plan of what it was to look like at our school. In the final months of school, we created a new vision and mission statement for Kent School. We also discussed the WHY of collaboration time. In the summer, we decided that on Tuesdays and Thursdays, during the period before lunch, we would have our teacher-librarian, our music teacher, and me available to cover classes so teachers can meet (2-4 teachers/staff – our special ed teacher is also able to cover for special education assistants so they can meet with teachers). In the summer, we also went through the details of the scheduling and then asked the question, “what are you curious about? If you were given prep-free time during the schedule, what would you explore?” We then posted all the questions and ideas on a board and put them into themes (ex. 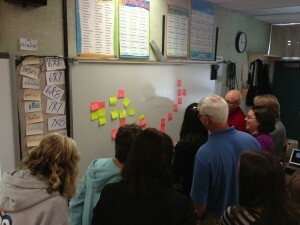 Technology, writing, self-regulation, outdoor education, and fine arts were some themes that stood out). Once the year started, I would create the schedule a week in advance and either staff would come to me with a need or question or I would go to them with encouragement to explore one of their questions. The time could not be used for a typical prep. The simplicity of this model concerned me. Would this really have any impact on our students? Would staff use the time effectively? We are one month into our experience of being a living systems learning community and the impact thus far has been significant. We have had a teacher and special education assistant completely redesign their room so it supports more students in their self-regulation needs. We have had our intermediate teachers meet to discuss cross-classroom art themes to explore and teach. Our music teacher worked with me to create a website that will help to better the communication with parents and share the musical learning happening in our school. We have had teachers (classroom and spec ed) meet with our child care counsellor to develop ideas on how to more consistently work as a team to teach the needed social skills of some of our students who struggle with behaviours. Our teacher-librarian met with a few teachers to discuss inquiry-based learning and implementing a different reading framework. The best part of all this is the simplicity. Our grade 6 teachers met with our First Nation Support Worker to discuss ways to embed learning around Residential Schools into many parts of the curriculum. The time we have created is basically “seed” time. The conversations do not end after 45 minutes; they continue through lunch as well as after school (in person and online). The time gets the ideas growing and more and more staff are asking for more time to meet to continue to grow these ideas. We have had a challenging September with a number of new students coming to our school that require significant support (that we do not always have). The stress level is very high but in spite of all this, there is a culture of learning and positivity in the air. Staff are excited to learn and grow with each other. Although we have not provided Google’s 20% time and we have not provided time for every teacher each week, the seed time we have created has encouraged teachers to set aside their busy schedules, meet with another staff member and simply tinker with an idea. There is never enough time… but this model has provided a window in to the impact that just a little bit of time can have for teachers to create positive change by meeting and tinkering with ideas. This model is messy and I do not know where this time together will lead us; however, it is also grassroots, strength-based, organic and all about meaningful, relevant, personalized professional learning. I am truly excited to see where our staff takes these ideas in the coming months. This post will be one of a few stories shared to initiate dialogue during my presentation, “Educational Leadership: Creating the Conditions For Passion and Innovation”, at the FREE Reform Symposium Worldwide E-Conference that happens October 11-13. My session will occur at noon Pacific on Saturday, October 11. Hope you can join us and share some ways we can create the conditions for more innovation and passion in our schools and learning environments. Thank you so much to Janet Lauman for her insights and leadership.